Bonfire of the Vanities: First Communion in Russia (and more!) -- updated with pictures! First Communion in Russia (and more!) -- updated with pictures! It was First Communion Sunday -- and I confess that each year, this fills me with both joy and, yes, some dread. The joy is obvious; why the dread? 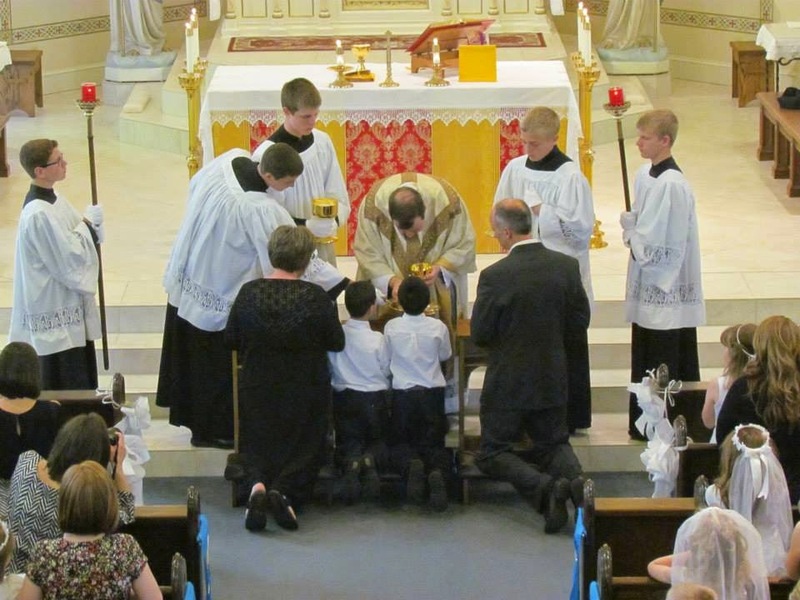 In years' past, the other priests I've worked with in my prior parishes and I have agreed the First Communion Mass can often be a "zoo Mass": a lot of irreverence and disruption, due entirely to the adults who are scrambling for seats, angling for a better view, snapping constant photos, and yakking loudly whenever possible. It's not edifying. This year was the best ever -- and while I am a bit jaded, that's not the main reason. The people of this parish, with the encouragement and good work of my predecessor, have a strong sense of reverence. The church is normally very quiet before and after Mass (I am probably the worst offender, greeting people in the vestibule). For the First Communion Mass, there was some commotion in the back as folks gathered for the group picture beforehand, and some chatting in church before Mass, but far less than I've seen. It helped that someone started the Rosary, as usual, about 20 minutes before. Have I mentioned the outstanding altar servers we have? 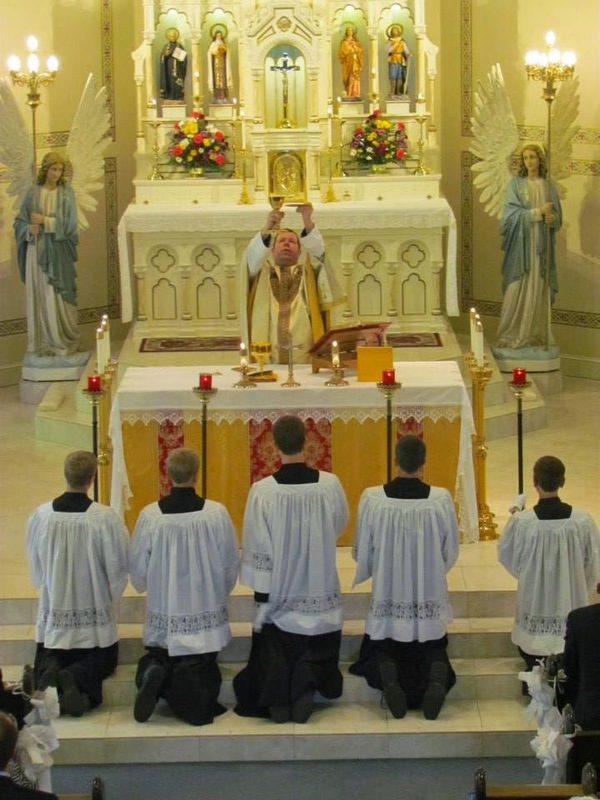 We have a crew of high school boys who love to serve; and whenever we have a "high Mass" (which now is every 9 am Sunday Mass), we have a crew of six to eight who don cassock and surplice, white gloves, and take care of the incense, the torches for the consecration and for communion. We have a battery-operated clicker that triggers the tower bells during the consecration, so that everyone in the village can know the miracle has happened! Well, we had our regularly scheduled "high Mass" at 9, and then another crew (one carry-over) for the 11. 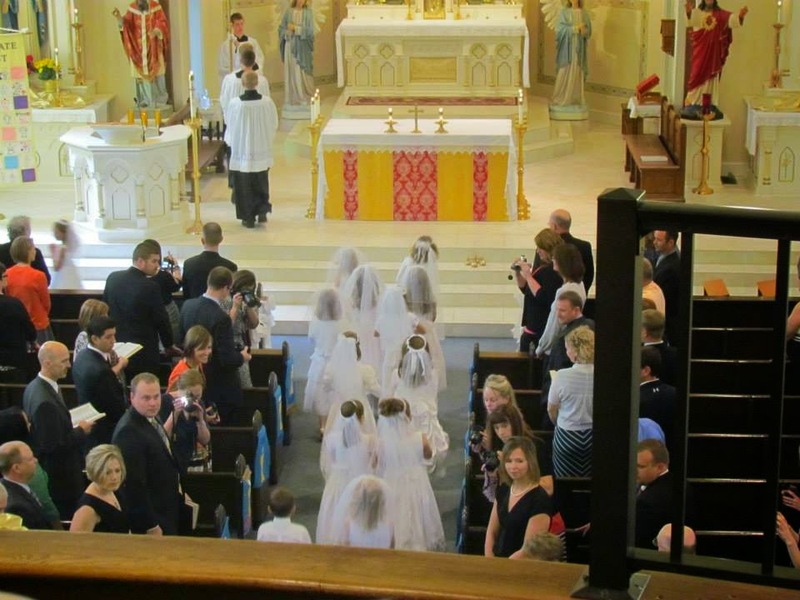 Then there's the special way we distribute Holy Communion to the first communicants. We set up three kneelers, and the child comes up with his parents. Everyone kneels down, and I give the child, then his parents, the Body and Blood at once, by intinction; which means, on the tongue. > The child comes up with his parents; that's easier and very appropriate. > The child doesn't have to make two stops; again, easier. > There's far less problem about what communion tastes like: sometimes the children don't like the dryness of the host, or the taste of the Precious Blood. This solves both problems. > The child is settled; sometimes, when they receive standing, they don't stay still. > It's all very calm and peaceful for the children. Later that afternoon, we had our boys' program, the Knights of Saint Remy -- attendance much reduced due to First Communion. I gave a talk on the four cardinal virtues (Justice, Temperance, Fortitude and Prudence), comparing them to parts of the armor a knight might wear. Fortitude was the breastplate that wraps all around, temperance the mouth-guard, justice the sword, and prudence the helmet. 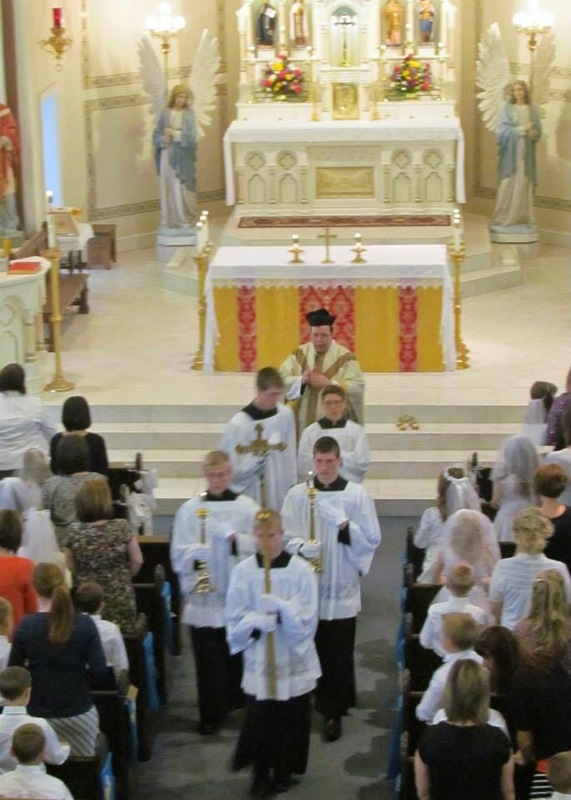 After that -- at the end of a very busy weekend that had me in Cincinnati Friday afternoon, for the deacon ordination on Saturday morning, then back to Russia for Mass, then the high school prom (they invite the priest to come! I've never had that anywhere else), then all I just described -- I was pretty tired! But a great weekend; I love being a priest! Don't we have a beautiful church? My venerable predecessor did all this. By the way, we would have had more torches, but we had the "High Mass Crew" at two Masses straight, and a lot of our high school boys had been out at the prom the night before. Here's the kneeling-intinction method I described. Everything worked like clockwork. It helps (a lot) to have well motivated, well trained altar servers. These boys are brothers, not twins but they made their First Communion together. 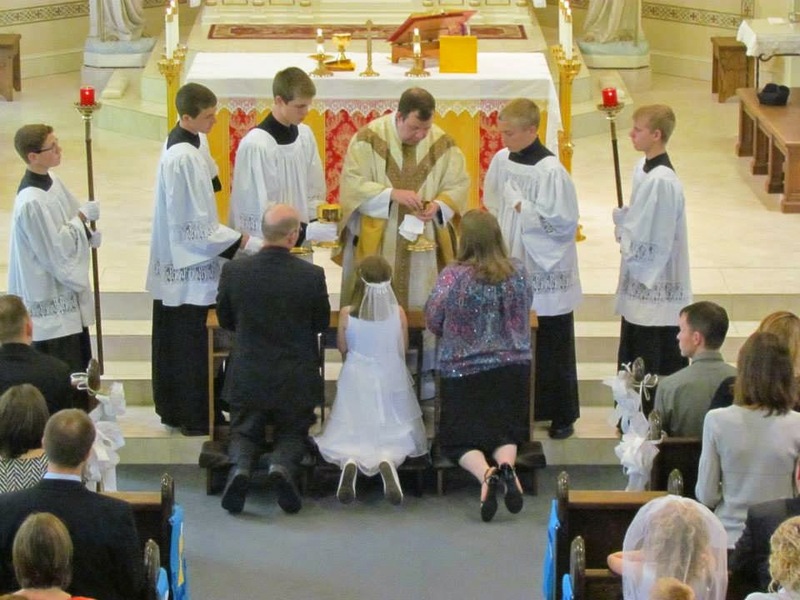 I like the way your approach in using kneelers for first communion and having them receive on the tongue with their parents receiving at the same time. I have sat in the pews for a few first communion's, and can tell that many of the children have not fully grasped the meaning of the blessed sacrament. 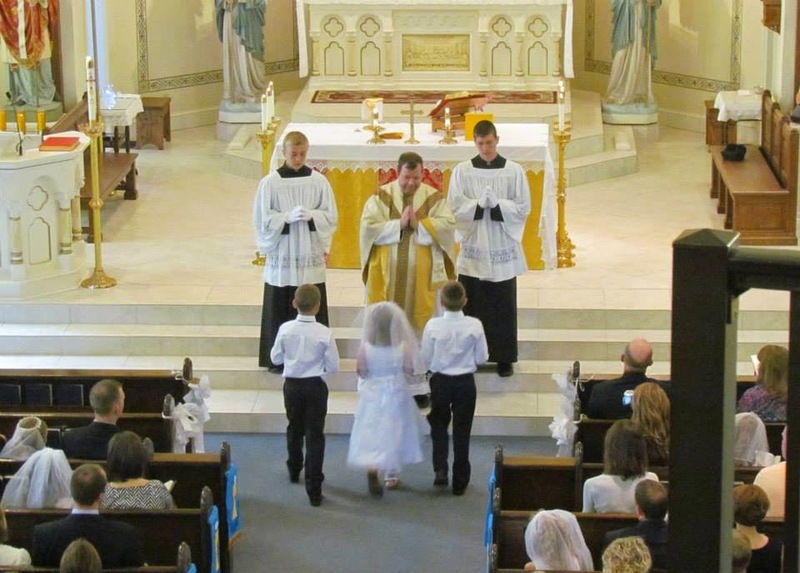 The well meaning priest explains the sacrament during mass, places it in their hand, and the child walks away holding it their hand confused what to do next. With your approach dignity is emphasized, and that confusion is kept to a minimum. That sounds lovely! I have to confess, I made a First Holy Coummunion as a child in the 1970s and I did not really understand what was happending. My memories of that day are unhappy. My mother was as obsessed with my dress as some brides on reality tv shows are. I think my parents were fighting. I am not sure. I was in attendance for this mass and it was absolutely beautiful. I particularly enjoyed the singing of young Miss York! It was truly a special day for the young folks of Saint Remy Parish. A big thanks to you Father and all our religious education teachers. Great job! You have a maniple! Does your parish have only the one or do you have the various liturgical colors for the whole year? I have most of the colors. I need 'em for the Extraordinary Form. You, your parishioners and your church are so admirable! I admit to envy... But also full of gratitude to God for this shining example of a beautiful, fully functional church! Beautiful. I especially like how bright it is in the church. Many older churches are sort of dark. This is just SO beautiful! Everything! Would that every parish in the Archdiocese did it just this way. I am so tired of seeing communicants receive the Lord's Body as if they were grabbing a cookie for snack time. ~ Rosemary A. Wonderful! (I read your comment at Fr Zuhlsdorf's post re MSW and the absence of agitprop at the NCRep, ha, ha, and realized it had been too long since I read here.) When I made my FC, as an adult, the pastor wasn't having any kneeling because, you know, we have 'progressed' or whatever; it was the mid-70s, however. On the other hand, the parish still had Stations and Benediction, at least in Lent.